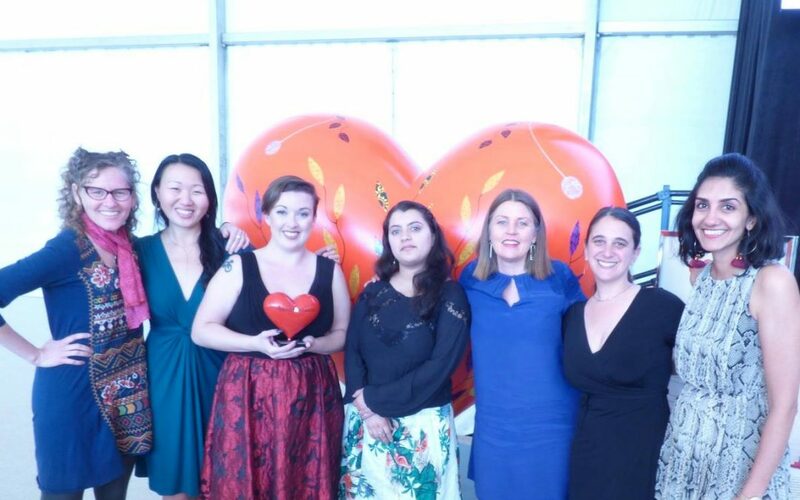 Left to right (Deborah Cohan, Monica Hahn, Caroline Watson, Yamini Oseguera-Bhatnagar, Shannon Weber, Rebecca Schwartz, Karishma Oza): Team HIVE supporting Caroline Watson at the 2018 Heroes & Hearts Award Ceremony. On February 15, 2018, the San Francisco General Hospital Foundation honored HIVE’s Caroline Watson and Karen Aguilar of Gender Health SF with the prestigious Heroes and Hearts Award. 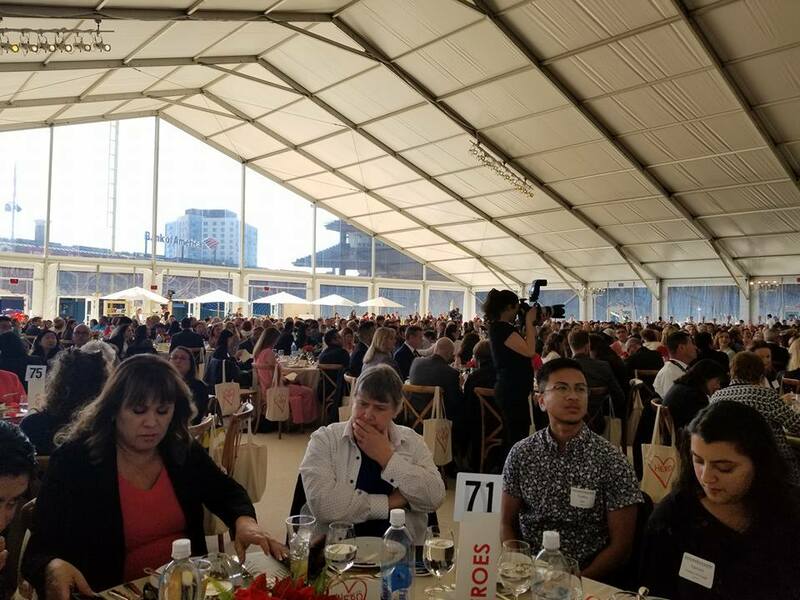 The luncheon and award ceremony took place on the field at AT&T Park in a tent, which held tables for 1,000 people, a stage, and heart sculptures from local artists. Since 2006, the annual ceremony has celebrated local heroes whose actions improve the San Francisco community. 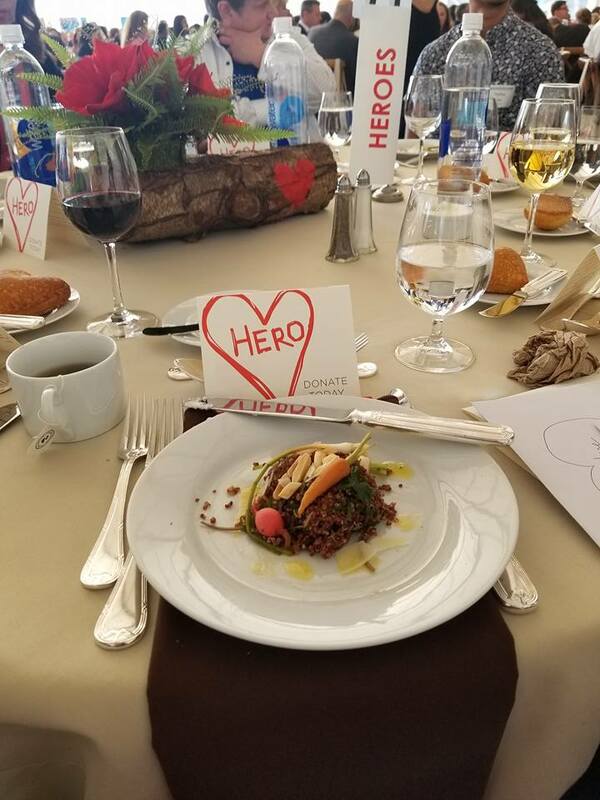 The event raises funds to support Zuckerberg San Francisco General Hospital & Trauma Center. We are extremely grateful for the support of the San Francisco General Hospital Foundation and our funders (The City and County of San Francisco, Macy’s, Mimi and Peter Haas Foundation, Gilead Sciences, Janssen, and many individual donors) for providing the opportunity for us to do this good work. 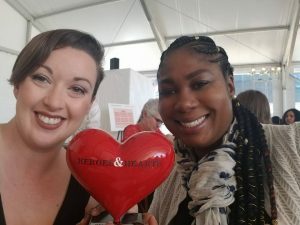 Thank you to the Heroes & Hearts Selection Committee for choosing Caroline and HIVE to highlight for this award. Those who worked hard to bring the story to life in photographs, video, written word, and in person: Lisa Hauswirth, John Noonan, Andy Miller & Plus M Productions, Sara Haynes, Amanda Heier, Matthew Shaffer, and Rachael Davison of Charles Zukow Associates. When Caroline came to Zuckerberg San Francisco General, she was homeless and pregnant. She received prenatal care and social services. Caroline became a volunteer shortly after her delivery in February 2013. She then became a communications intern followed by a staff member with the title of Social Justice and Communications Coordinator. During this same period as she raised her young daughter, Caroline graduated from community college with a 4.0 transferring to Cal Berkeley in the fall of 2017 to major in social work. Caroline has emerged as an inspired leader who has transformed the online dialogue from and about women who are impacted by HIV. She is fiercely committed to community inclusion as she betters the world around her. This is a woman who boldly walks the talk. Caroline has shared her story with many HIVE patients and consumers around the world who contact HIVE through social media and the HIVE blog. Caroline has shared her story in a book chapter, with reporters across the globe, and thousands of people who engage with HIVE’s robust online presence. Caroline collaborated with advocates across the U.S. to launch the #LanguageMatters initiative, challenging providers to use non-stigmatizing language with their patients. #LanguageMatters is now referred to in academic articles, presentations, and has been referenced by community based organizations as the new standard for inclusive language in content and spoken word. As the point person for HIVE’s website and online presence, when Caroline noticed the women who blogged for HIVE were not representative of the women most impacted by HIV, Caroline set out to change the way we engaged with potential bloggers and in doing so has reshaped the narrative in the HIV prevention for women space. Her response was the development of the “Share Your Story” campaign with targeted online and in person outreach to people affected by HIV whose stories had not yet become visible. The success of the Share Your Story campaign was highlighted in this A&U PrEP Champions Story. Caroline Watson and Nikole Trainor pictured here after their speeches. Caroline, since the day I met you, you have been a shining light in my life. Your genuine love and passion to help people speaks volumes about your courageous unselfish character. If it’s about helping someone, you don’t take NO for an answer. You constantly go above and beyond your call of duty. For example, while Caroline and I were in New Orleans for the HIV Biomedical conference, she met a young African American man who hadn’t been tested for HIV in some time. In fact, I believe he had some anxiety about getting tested. Caroline, as usual, with her big warm heart, comforted this young man to ease his anxiety, provided him with additional health education around HIV, found a local clinic in the area that provides free HIV and STI testing, schedule an appointment for the young man, and showed up the next day with him at the clinic so he can get tested. After his negative results, she then gave him additional information about PrEP (Pre-Exposure Prophylaxis), a daily pill that can prevent HIV, and information on how to access PrEP. Some people may view this is a simple act of kindness….Being that Caroline is in the public health field, this is simply what she is supposed to do…For many of you who do not know, Black men bare a disproportionate burden of HIV acquisition nationwide, especially in the south. This was no simple act of kindness, Caroline saved this man’s life. No one said it would be easy, if it were easy, there would be no Caroline Watson. 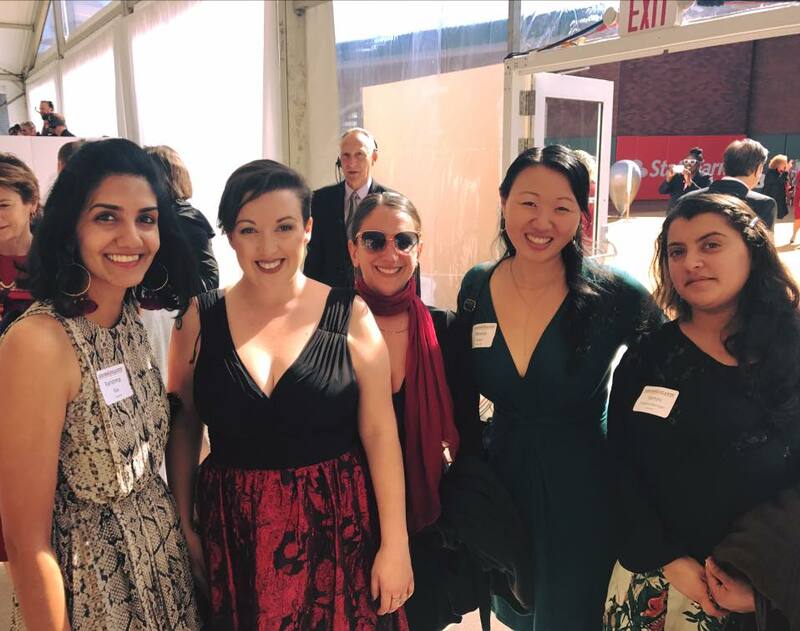 Left to right: HIVE team members Karishma Oza, Caroline Watson, Rebecca Schwartz, Monica Hahn, Yamini Oseguera-Bhatnagar enjoying the event. More photos from the Heroes & Hearts 2018 ceremony are available here.